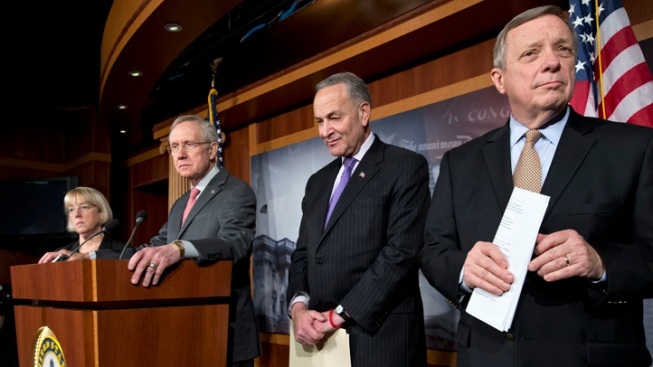 Senate leaders staged votes Thursday on two dueling bills to avert the sequester, neither of which was expected to pass. Squabbling away the hours, the Senate swatted aside last-ditch plans to block $85 billion in broad-based federal spending reductions Thursday as President Barack Obama and Republicans blamed each other for the latest outbreak of gridlock and the administration readied plans to put the cuts into effect. So entrenched were the two parties that the Senate chaplain, Barry Black, opened the day's session with a prayer that beseeched a higher power to intervene. "Rise up, O God, and save us from ourselves," he said of cuts due to take effect sometime on Friday. The immediate impact of the reductions on the public was uncertain, and the administration pulled back on its earlier warnings of long lines developing quickly at airports and teacher layoffs affecting classrooms. On the Senate floor, a Republican proposal requiring Obama to propose alternative cuts that would cause less disruption in essential government services fell to overwhelming Democratic opposition, 62-38. Moments later, a Democratic alternative to spread the cuts over a decade and replace half with higher taxes on millionaires and corporations won a bare majority, 51-49, but that was well shy of the 60 needed to advance. Republicans opposed it without exception. In a written statement after the votes, Obama lambasted Republicans. "They voted to let the entire burden of deficit reduction fall squarely on the middle class," he said. He noted that he would meet with congressional leaders from both parties at the White House on Friday, but no one is expecting action before the cuts begin taking effect. Obama said, 'We can build on the over $2.5 trillion in deficit reduction we've already achieved, but doing so will require Republicans to compromise. That's how our democracy works, and that's what the American people deserve." Said House Speaker John Boehner, the top Republican in Congress: "Obama and Senate Democrats are demanding more tax hikes to fuel more 'stimulus' spending." Though furloughs are a fear for some, especially certain federal workers, there is little sign of business worry, let alone panic in the nation. Stocks declined slightly for the day after trading near record highs. And unlike the "fiscal cliff" showdown of two months ago, there are no deadlines for action to prevent tax increases from hitting nearly every American. Still, there was talk of crisis. "We have the opportunity to avoid the kind of calamity and disaster that is being threatened and is completely unnecessary," said Sen. Pat Toomey of Pennsylvania, who co-authored the Republican proposal. "The question is, are we going to achieve these savings through badly designed spending cuts that make no attempt whatever to distinguish between more sensible government spending and less sensible spending?" Sen. Patty Murray of Washington said that was precisely what Democrats had tried to do by proposing the deferral of Pentagon cuts until U.S. combat troops have come home from Afghanistan in two years' time. At the same time, she said the Democrats had reasonably proposed replacing half of the pending cuts with higher taxes on "the wealthiest Americans and biggest corporations." In fact, the Democratic measure also included small increases for a variety of small programs such as biodiesel education, assistance for biomass crops and certification of organic foods. Boehner and House Republicans show no hurry to alter the cuts, contending they provide leverage with Obama in their demand for savings from government benefit programs. Yet they are expected to launch legislation next week to replenish government coffers after current funding expires on March 27, and that measure could become a magnet for new attempts to change Friday's "sequester." Already, some Republicans held out hope the current struggle might lead to talks on completing work on the final piece of a deficit reduction package that has been more than two agonizing years in the making. "The objective here ought to be not just to deal with sequester but to deal with the underlying spending problems, which require tax reform" as well as reform of benefit programs like Medicare, Medicaid and Social Security," said Sen. Rob Portman, R-Ohio. Democratic senators emerged from a lunch with Transportation Secretary Ray LaHood and top Pentagon officials and said the current cuts could not be allowed to stand. Sen. Chris Murphy, D-Conn., said the session had confirmed to him that as currently constituted, the cuts were 'a really, really dumb idea." In a cycle of crisis followed by compromise over the past two years, Obama and congressional Republicans have agreed to more than $3.6 trillion in long-term deficit savings over a decade. None of the savings to date has come from the big benefit programs that lawmakers in both parties say must be tackled if the country is to gain control over its finances. Each party fears the political fallout of confronting them on their own, but Democrats, in particular, are reluctant to scale back programs that they count as their political birthright. Their rival speeches on the Senate floor weren't the first time that Toomey and Murray disagreed on economic issues. Both served on a so-called congressional Supercommittee in 2011 that was charged with producing at least $1.2 trillion in savings over a decade. The panel deadlocked, automatically triggering the across-the-board cuts that now are imminent. As constituted, the cuts would total $85 billion through the end of the current budget year — Sept. 30 — half each from defense and non-defense programs. Large parts of the budget are off-limits, including programs for veterans, Social Security and Medicare benefits. The Republican alternative would have required Obama to propose an alternative that relied exclusively on spending cuts, ruled out tax increases and limited what he could take from Pentagon accounts. The Democratic measure would have canceled the $85 billion in cuts, and replaced them with a combination of tax increases and cuts to defense and farm programs that would phase in over a decade. Deficits would have risen by more $42 billion in the first year and $38 billion over the two following years before gradually beginning to decline. While the White House has issued a steady stream of severe warnings about the impact of across-the-board cuts, the president said Wednesday night, "This is not a cliff, but it is a tumble downward. It's conceivable that in the first week, the first two weeks, the first three weeks, the first month ... a lot of people may not notice the full impact of the sequester."